Summary: With a huge choice of slots, big jackpots and a new player welcome bonus, Starpins is a highly recommended site. 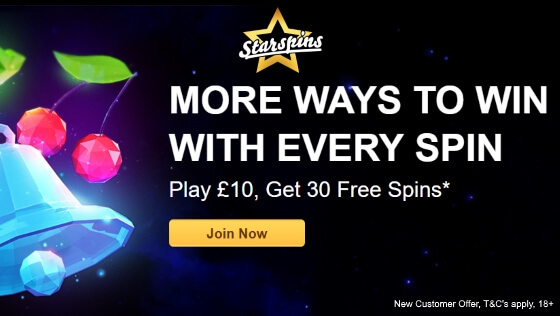 If you are one of the many people that prefer the online slots to the online bingo – then the Starspins website is just for you. This site is 100% slots only with a Welcome Bonus for new players that can see you receiving free spins – more details here. 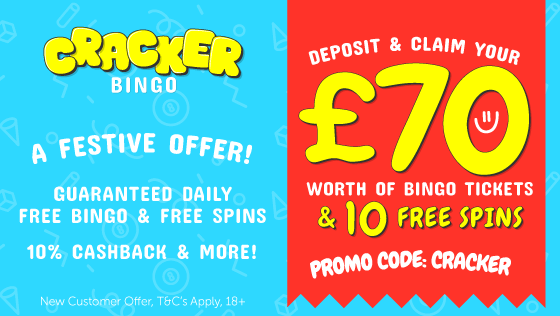 There are also FREE spins on your daily FREE game to win real cash and more than 95% return to players sitewide. So for all those people that believe sometimes bingo can get in the way of slot play, Starspins is ideal. Gamesys is the software platform underpinning the site, just like at Jackpotjoy and the feel of the site will be familiar to many. There is a vast selection of online slot games currently available at Starspins including favourites such as Double Bubble, Wonderland, Rainbow Riches, and Monopoly. In addition, there are some unique games that will not be found anywhere else. What helps make Starspins unique is the concept of offering the whole playing community the opportunity to benefit from a big win where players share a jackpot the same amount as the winner of any star jackpot. This Star Jackpot opportunity pops up randomly during ordinary gameplay. The chance to spin for free for the Star Jackpot appears at random times on screen no matter the coin size being played. There are five reels and if all the symbols that fall into place are the same then the progressive jackpot attached to it is released. So if slots are your thing then Starspins is a must for a great choice of games, jackpots and more payouts than any other slots site. Click the button to play at Starspins today!